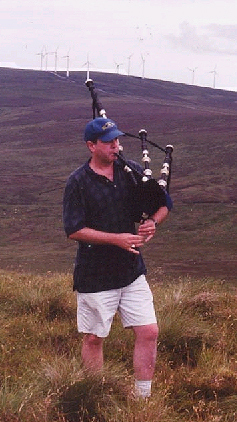 Michael Francis Bell began taking instruction on the Great Highland Bagpipe in 1992 after moving to Hampton Borough, Hunterdon County, New Jersey, from Virginia. He is originally from the Philadelphia, PA, area and was graduated from St. Joseph's University. He also received a Master's in International Relations from the University of Southern California while serving in the U.S. Army in Augsburg, Germany. He now lives in Galloway, Atlantic County, New Jersey (NJ). Michael is married to Regina (nee McAleer) and has three sons: Curran, Kevin, and Michael Sean. His first experience playing the bagpipes came through St. Ann's of Hampton (NJ) Pipe Band, a band founded under the patronage of St. Ann's then pastor, Fr. William J. Hewitt. Michael played with St. Ann's from 1992 until 1999. The original instructor of that band was Joe Keely, who founded the NJ State Police band, the Pipes and Drums of the Blue and Gold. 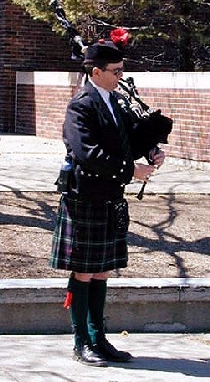 Michael then played with the Pipeline Pipeband of Haskell, New Jersey, from its founding in September 1998 until May 2003. 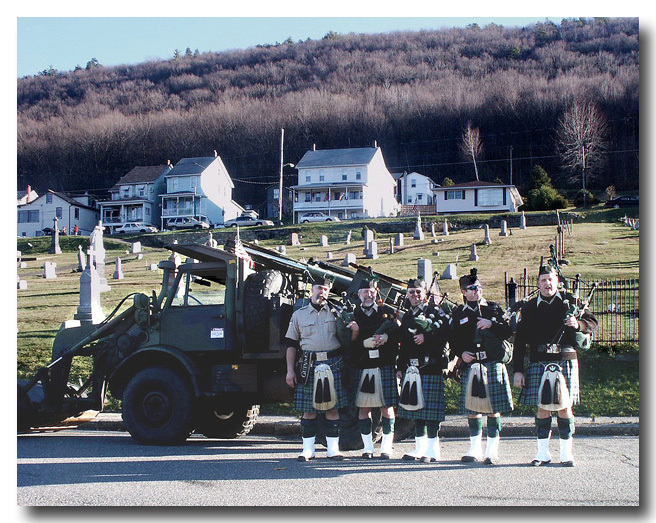 Michael is also a former member of the Poconos Region Pipes and Drums, with whom he played 2003 to 2005. 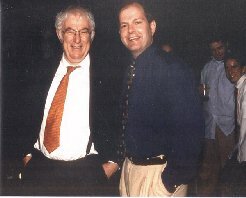 He also played at two events with the CuChullain Pipe Band in Morris County NJ in 2004. After moving to Atlantic County in late 2004, he played with the Celtic Rock band Birnam Wood through March 2007, and once in March 2008. In 2011, Michael played with an AC/DC tribute band and with No Leaf Clover. During the Saint Patrick's Day season of 2015, Michael played with The Kilted Johnsons. Michael, a Technical Writer and Instructional Designer by trade, designed an award-winning website for Pipeline Pipeband, the Castle Dangerous web site, and the original Pipeline Bagpipe and Highland Supply e-commerce site. Michael is a member of the Eastern United States Pipe Band Association (EUSPBA) and has competed in solo and band events at Highland Games and Festivals from Vermont to Virginia. Michael won a first place solo piping medal at the Mid-Atlantic Branch EUSPBA Spring Meeting combined Grades III and IV 2/4 March Competition in April 1999. At the Monmouth Celtic Festival and Feis on May 5, 2001, Michael was awarded the second place medal in the Grade IV Senior 2/4 March. Michael also achieved a fourth place finish in the 2/4 March competition at the Rockland County AOH Feis on July 22, 2001. Michael now pipes at the Grade III level in EUSPBA Solo Piping competitions. With regard to piping instruction at workshops and summer programs, Michael completed the 78th Fraser Highlander's Pipe Band's Celtfest piping workshop in 1996, which was held in Etobicoke, Ontario, Canada; the Simon Fraser University Pipe Band's Highland Arts Festival piping courses in 1998, which was held at Montclair State University in Montclair, New Jersey; the North American Academy of Piping and Drumming week-long Summer Program in 1999, which was held in Accident, Maryland; the Delco Mid-Atlantic Bagpipe Workshops in 2000, 2001, and 2002, which were held in Radnor, Pennsylvania and, most recently, the 2008 workshop, which was held in Lithicum Heights, Maryland (BWI airport); the Red River Pipes and Drums Workshop in 2003, which was held in Shreveport, Louisiana; and the United States School of Piping, which was held July 11-18, 2008 in Flagstaff, Arizona, where one of his instructors was Aaron Shaw, the "American Idol bagpiper." Michael also took bagpipe tuition for four years under the pipe major of Pipeline Pipeband, Gerry Rooney, who began his piping tuition with Fred Morrison, Sr. and later studied with P/M Angus MacDonald, M.B.E., George M. Bell, and Donald F. Lindsay. Michael maintains a busy piping schedule, playing the bagpipes at innumerable private functions such as weddings, funerals, birthday parties, anniversary celebrations, and other events in New Jersey (NJ), Pennsylvania (PA), New York (NY), and Delaware (DE). Read testimonials from some of Michael's clients here. To hire a piper or pipers for your event, contact Michael via castledangerous@gmail.com or phone 609-744-0606. © 2001-2012 Castle Dangerous. All rights reserved. Not for dissemination or other use without the expressed, written permission of the author.